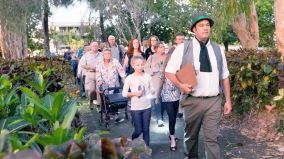 Cairns and District Family Historical Society received $8442 in Everyone’s Environment funding to engage volunteers to perform cemetery tours of the history of the McLeod Street Pioneer Cemetery, Cairns. The Historical Society delivered eight performances during the months of July, August and September 2014 with a total of 500 people attending to watch volunteer actors recreate the lives and deaths of early settlers at their tombstones at the Heritage listed McLeod Street Pioneer Cemetery together with atmospheric music from the Cairns Brass band. This project provided the local community with an experience into the history of the historic site.